John Prentice is the current Chairman of the Tramway & Light Railway Society, the Manager of the Festival of Model Tramways and the owner of this website. 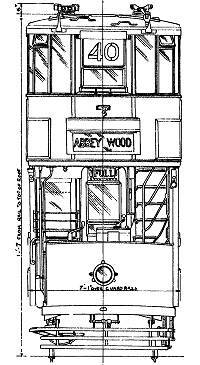 1:16 scale (3/4" to 1') high quality "General Arrangements" black and white line drawing of the London Feltham type tram. Especially custom drawn with the model maker in mind, but suitable for research or decorative purposes. Drawing measures 66 cm x 97 cm (26" x 38"). From 1930 this tram type was built for the Metropolitan Electric Tramways and the London United Tramways, which in 1933 became part of London Transport. After 1952 they ran in Leeds. 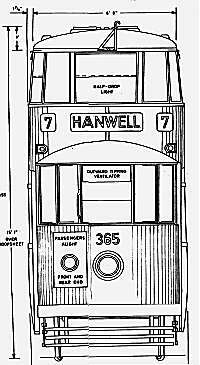 The view (right) is a much reduced extract of part of the drawing, showing the front of the tram. The actual drawing also shows the sides and the interior layout. The drawing costs £6.50 plus postage/packing. 1:40 scale high quality "General Arrangements" black and white line drawing of the London County Council E/3 type tram. Drawing measures 23 cm x 51 cm (9" x 20"). These are are modern prints but taken from an original drawing that was probably made by the L.C.C. themselves. It shows the tram in its open-fronted condition, as first built in 1930. The view (left) is a much reduced extract of part of the drawing, showing the front of the tram. The actual drawing also shows the sides and the interior layout. The drawing costs £3.25 plus postage/packing. These drawings can be obtained from TLRS On-line Sales.